Omar Barghouti on BDS: How Effective Is It? The Israeli government, which adopted a very aggressive counterstrategy, “likes to believe it is somehow winning the fight against BDS,” but that view is “quite delusional,” says Palestinian activist Omar Barghouti, who co-founded the BDS movement. SHARMINI PERIES: It’s The Real News Network. I’m Sharmini Peries coming to you from Baltimore. It was 12 years ago that 170 civil society organizations in Palestine called for the boycott, divestment, and sanctions against Israel, and launched the BDS movement. The movement seeks to put pressure on the Israeli government and government institutions to respect international law and end the injustices towards Palestinians. It has three demands: one, the end of the occupation; two, the return of the Palestinian refugees; and equal rights to all the citizens of Israel.As the movement grows and spreads around the world, so do the Israeli counter-campaign to silence BDS. Here’s a short video published by an Israeli politician, Yair Lapid, in the attempt to combat BDS. Yair Lapid: Israel is under constant attack of lies and smears throughout the world. Today, we are launching a campaign to defend the country. We recruit the good Israeli citizens who travel abroad, which are regularly caught up in debates and need to have proper arguments. We have here a pocket-sized booklet. This is the beginning of our campaign. In the booklet, we supply four, five, six decisive arguments which allow you to win every argument, so that every Israeli will become an ambassador defending Israel abroad. We cannot carry on leaving the arena to haters of Israel. We need to defend Israel’s good name in the world. We are being vilified and are being slandered, and it’s time for us to respond. SHARMINI PERIES: Now joining me to discuss all of this is Omar Barghouti. He is a Palestinian activist for justice and equality, a co-founder of the Boycott, Divestment, and Sanctions movement, BDS, and of PACBI, the Palestinian Academic and Cultural Boycott of Israel. Omar, good to have you back with us. OMAR BARGHOUTI: Thank you very much, Sharmini. SHARMINI PERIES: Omar, give us a short update about the recent successes of the BDS movement. Is it affecting the Israeli economy? OMAR BARGHOUTI: We think it is, yes. After succeeding with convincing many musicians, and music bands, and filmmakers, and writers to avoid participating in Israeli festivals, after convincing many academic associations in the United States, like the American Studies Association, the National Women’s Studies Association, Asian studies, and others to boycott Israeli academic institutions, after so many successes in the academic and cultural sphere, since 2013-2014 we started to see a trend of an increasing economic impact.We started to see major pension funds around the world divest, sell their shares in Israel companies, Israeli banks, or international companies that are deeply complicit in Israel’s occupation and violations of Palestinian human rights. For example, the second-largest Dutch pension fund, the Presbyterian Church USA, the United Methodist Church, the Norwegian Sovereign Fund, some of the largest funds in the world started to divest from Israeli banks and U.S. companies, French companies, other companies involved in Israel’s occupation.This economic impact started to have some recognition in the mainstream media, and even among financial institutions. Moody’s, a credit ratings agency, said a couple of years ago that although BDS was not yet having a substantial impact on Israel’s still-strong economy, thanks to U.S. subsidies and European subsidies, if it grew, if it gains traction, it will have a significant impact on Israel’s economy. Israel realizes that, and so do we. 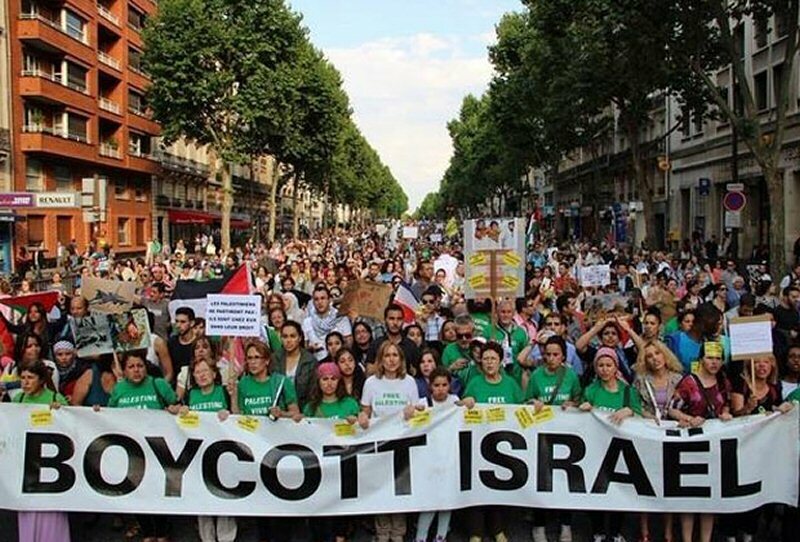 We have seen three major corporations quit the Israeli economy under BDS pressure, especially Veolia, a French conglomerate that lost over $20 billion worth of tenders around the world over a seven year period of BDS very effective campaigning. After that, Orange Telecommunications, CRH, an Irish company, and so on and so forth. We’re starting to see that impact on investment in Israel, as well. SHARMINI PERIES: Omar, inside Israel-Palestine, the Israeli government and the parliament are promoting a series of measures to try to make it illegal for people to support the BDS movement. There is an anti-BDS law dating back to 2011, to the current bill that’s promoted by the Israeli government to criminalize BDS and apply fines to $25,000 to $75,000 for each BDS supporter. In the right-wing newspaper Israel Hayom, your name was mentioned twice in the context of which individuals and organizations that will be targeted by this law. Explain, what is the Israeli government trying to do here? How effective has it, and how has the targeting of you specifically affected the campaign or you personally? OMAR BARGHOUTI: After 12 years of utter failure in stopping the impressive growth of BDS, especially growth in the mainstream in Western countries, across major trade unions, pension funds, major churches, even in Hollywood. Of the 26 Oscar nominees last year in 2016 were offered a very expensive junket by the Israeli government, none of the 26 Hollywood stars accepted that junket. Of 11 NFL players this year offered a similar junket by the Israeli government, six said no, including Michael Bennett. We’re seeing the impact of BDS even into the ivory tower, in the United States and elsewhere.After this repeated failure by Israel, and after adopting a very aggressive counter-strategy in 2014 against BDS, including espionage using Israel’s intelligence services, legal warfare, propaganda on steroids, and still Israel feels that the movement continues to grow. They’ve resorted to McCarthyite tactics, adopting a “blacklist” of Israelis supporting any form of boycott, whether it’s a settlement boycott or a full boycott of Israel does not matter, and a ban on entry for anyone who supports BDS or who is associated with an institution supporting BDS. An official from the Presbyterian Church USA could be denied entry at Ben-Gurion Airport simply because she or he belongs to the Presbyterian Church, which has adopted a form of boycott of settlement goods or divestment from HP and other companies.The recent attempt to pass a law that you’ve talked about is trying to say that any Israeli institution or individual that suffers due to a boycott can go to court and be offered compensation without having to prove any correlation between the damage that they claim to have incurred and the advocacy for a boycott against them. Without any correlation, they can get damages. In fact, it’s much more than 75,000. The maximum is 500,000 shekels, which is about $130,000 or so.The attack against me personally is just an attempt to demonize me as a human rights defender, to try to chill support for BDS, to say, “Here, we’ll teach you all a lesson by making Omar Barghouti’s life miserable.” They’ve imposed a travel ban on me, which is still in effect. I need a court order to travel every time. They’ve threatened me with civil assassination. I have no idea what that means, but it sounds scary enough, and all kinds of intimidation. They’ve used the tarnishing unit, which is a property called tarnishing unit, as part of the Ministry of Strategic Affairs in Israel, which coordinates the government’s fight against BDS. They’ve used the tarnishing unit against me, but this is all intimidating, indeed. This is all bullying, trying to bully me indeed, but it won’t deter me from continuing my modest role in this very noble movement for Palestinian freedom, justice, and equality. SHARMINI PERIES: Omar, as you mentioned the example of the leader of the Presbyterian campaign that is helping the BDS movement being denied entry to Israel as one example, which points to the fact this movement is global. The Israeli government has now appointed a minister, Gilad Erdan, to lead the task force against BDS, and has armed it with a huge budget of hundreds of millions of dollars with support from military intelligence units and so on. Do BDS activists in Europe, North America, and the U.S. already feel the result of this campaign that’s being launched? I guess this minister was appointed about two years ago, if I recall. Is that minister having an effect internationally as well? OMAR BARGHOUTI: The Israeli government likes to believe it is somehow winning the fight against BDS. Quite delusional, if you look at the facts. The Israeli government has a lot of influence with Western governments, with the U.S. Congress, with the White House, with Brussels, the European Union. Indeed, we recognize that. Of course Israel is an expert in using its intimidation power, its bullying, and in many cases, buying the loyalty of politicians, as even Thomas Friedman of the New York Times at one point admitted when he said, “Our politicians in Congress are bought and paid for by the Israel lobby.” Those are the words of Thomas Friedman of the New York Times. Yes, it can succeed at that level.What it’s doing is that it’s losing the grassroots level. It’s beginning to lose the liberal mainstream that is utterly disgusted by all this McCarthyism, all this intimidation. Conditioning the hurricane humanitarian relief in Texas on loyalty to Israel and refusal to support the boycott of Israel has hit a raw nerve among liberals in the mainstream in the United States, with many, many liberal organizations going up in arms and condemning the lobby’s corrupting influence in various state legislatures in the U.S.Yes, Israel is succeeding in passing very strong anti-BDS legislation across the U.S. It is succeeding in getting the French government to be as authoritarian as it can be, anti-democratic, draconian as it can be. The British government running after trade unions that support BDS and trying to ban local councils from divesting from companies that do business with the occupation. It can succeed there, but we’re winning the fight at the grassroots level. We’re winning the hearts and minds battle, and we are increasingly winning the liberal mainstream. Israel realizes that, and that’s why it is going hysterical with passing more and more extremely draconian legal measures. SHARMINI PERIES: Because of the alliance between the United States and Israel, the Israeli government and the U.S. government, many people argue that the bond is so strong that if you are boycotting the Israeli government and business ventures and corporations in Israel, that should also be extended to the United States. If you’re carrying out a boycott of academic institutions in Israel, academics participating in exchanges, and so forth, that that should also be carried out here in the United States. What is your response to that? OMAR BARGHOUTI: In fact, the academic and cultural boycotts do not target individual academics or artists in Israel. They target Israeli institutions due to their complicity in planning, implementing, justifying, whitewashing Israel’s various human rights violations, apartheid policies, military occupation, ethnic cleansing against the Palestinian people. The bond is between the Israeli government, the Israeli regime of occupation, and settler colonialism, and the 1% of the U.S. that have a deep interest in maintaining perpetual war and colonial aggression by Israel in testing the latest American weaponry on Palestinian guinea pigs and then marketing those weapons around the world as field-tested. Many in the security establishment, the military-industrial establishment in the U.S., have an interest indeed in Israel’s colonial wars, and suppression, and apartheid against the Palestinian people and the entire Arab neighborhood.The absolute majority of Americans have no interest in this aggression. Recent polls have shown, like a Brookings Institution poll in 2016 has showed, that almost half of the entire American population supports sanctions or tougher measures against Israel to stop its occupation. 60% of Democrats support sanctions against Israel. Where is this reflected at the policy-making level, in Congress, or in the White House? It is not reflected, but this tells us a lot about U.S. democracy and its flaws. Something is changing in the mainstream. Many, many more are asking for sanctions on Israel, and many more are connecting the injustices at home in the U.S., from police brutality and exchange programs with Israeli police, from the cuts to social services, health, and education in the U.S. and inner cities, and the extreme generosity spending $38 billion to support Israel militarily over the next 10 years. People are connecting the dots and seeing those wars that Israel is conducting and getting us involved in as the U.S. are not helping the absolute majority of Americans. They’re helping the 1%, and they’re helping the Israeli war economy. SHARMINI PERIES: Omar, the South African anti-apartheid struggle and the boycott movement was successful because there was a lot of international organizations and individuals who supported it, and finally, I think, it led to the end of apartheid. Where are we at in the scheme of things when it comes to the BDS campaign and successful liberation of Palestine? OMAR BARGHOUTI: We feel that our South Africa moment is arriving, but it will take years of more grassroots movement-building and more influencing of the mainstream around the world. We’re not there yet, but we’re getting there. When people compare BDS for Palestinian rights with the anti-apartheid boycott that was very active especially in the ’80s, and they say, “In the ’80s, the anti-South African apartheid movement was already mainstream and affecting a number of people in Congress already, but BDS is not there, so do you have any hope?” That kind of argument is very, how should I call it, I call it a snapshot vision, taking a snapshot of reality, freezing time, and freezing context.I was personally a tiny, tiny little part of the anti-apartheid campaign when I went to school at Columbia University in New York, but it took forever for the anti-apartheid boycott to become mainstream. People look at the end of the ’80s and they think it was rosy throughout. In the ’60s and ’70s, it was a drought of activism in support of the anti-apartheid movement. It grew into the mainstream only in the 1980s in the United States, the U.K., and other countries around the world. Building a movement takes a very long time, but building it on proper principles of universal human rights, on an anti-racist platform is the guarantee to make this movement grow, and using the right strategic tactics to make sure to influence the mainstream is what the BDS movement for Palestinian rights is doing. We’re getting there, but it will take more years and more efforts by everyone, and more support by everyone. SHARMINI PERIES: … joining us today. All the best with the struggle. SHARMINI PERIES: I welcome you back anytime on The Real News. Thank you. OMAR BARGHOUTI: Thank you very much.